It is apparent that specific dates, times, and predictions of what is to come in the days ahead are still elusive and uncertain. Prophetic voices all vary on details though all share a consistent message: The kingdom of heaven is coming with great power and authority to displace the kingdoms of this world. That which is ordained to take place – both good and bad – will usher in a harvest of souls that is global and supernatural. Though most are focused on the “What?” it is time to look at the more important questions of “What now?” and “How do I get ready?” We must prepare for the reality that God’s world is about to invade ours. Heaven is coming to earth. The spiritual activity that is coming is of another realm. It is other-worldly and one in which many are totally unprepared. The world of the spirit and of the flesh are about to collide. In a recent dream, it was clear that only those who were “led by the Spirit” were able to navigate their way through the challenges that are coming. Walking and living in the Spirit will no longer be just a theological principle or devotional topic. It will become reality and, more importantly, it will be the distinctive that marks and separates the true sons and daughters of the kingdom from those who aren’t. Be filled with and live by the Spirit daily – We must learn to lean into His heart and His voice throughout our day – not just during our devotional times. He wants to consume us and fill us so completely that no flesh remains. He isn’t out to “fix” our flaws or redeem our flesh. He wants to KILL it! As it is removed and separated, just as dead flesh is sloughed off, we will make room to be totally and completely filled by HIM and the life of His Spirit (Romans 8:5-11). Learn to hear and discern His voice clearly – Do you know the real from the false? Can you rightly distinguish counterfeit signs and wonders from the true ones? At a time when more and more spiritual counterfeits will emerge, we need to fine-tune our hearing and our seeing in order to follow that which is holy, pure and of the Spirit of God. Embrace the supernatural as natural – The enemy has totally disabled the Church by robbing believers of the truth and reality of the supernatural realm. There are counterfeit signs and wonders only because there are REAL ones. Remember – heaven is coming to earth. We must be prepared to see and experience things we don’t understand (Acts 2:1-12). What Hollywood is displaying in many movies about the supernatural are actually kingdom realities that psychics and false prophets discovered long ago. It’s time to reclaim the realm of the spirit and operate as true sons and daughters who have been given rightful authority and access to this dimension, not for entertainment, but for the glory of God (Zechariah 3:7; Hebrews 12:22-24). Draw close to family and covenant relationships – God honors and blesses covenant relationships where his kingdom is being manifested and godly government has been established, led by the Holy Spirit. We are about to experience a level of community life like never before and it will be essential to be connected to and participating in a healthy family of Spirit-filled and empowered believers. Replace fear with bold faith – Fear is a spirit and is going to increase in the days ahead and we cannot afford to be crippled by fear of any kind. We must press in to encounter the spirit and power of God’s love to demolish every fear. This will be one of the enemy’s greatest weapons and we must be prepared to face it with boldness, confidence and absolute trust in God’s ability to deliver. It is the spirit of the Fear of the Lord that will ultimately displace every other fear (Proverbs 14:26). Seek the kingdom of heaven – We cannot focus on what is seen. Faith must be established by fixing our eyes on the unseen realm and the kingdom of heaven that is coming to displace the broken systems of this world. We can’t make the same mistake that the disciples made and totally miss the point of Jesus’ coming. He is not concerned with fixing the world’s problems. He is coming to establish HIS kingdom, throne and rule. Learn to recognize and come under HIS kingdom. Maintain a place of His Presence – The safest place to be in the days ahead will be IN HIS PRESENCE (Psalm 91:1). “Sanctuaries” of His presence are even now being established in homes, congregations, and cities across the nation. Cities of Refuge will be known as places where God’s presence has been welcomed and maintained by those who have kept their lamps burning (Matthew 25:4). Make this a priority to keep the fire on the altar of His presence burning, drawing others to its light. 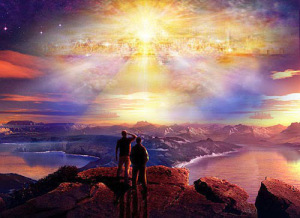 Pray that many will come into the truth of life in the Spirit and the realm of heaven which is about to be revealed. The spirit of the age has tried to blind many to this reality making it a stumbling block and hindrance. The world of the flesh is dying – and MUST die – in order to make room for that which is eternal, powerful and fully SPIRIT. This is so good Wanda. I want to be in covenant relationships but even though we are in a church most have no idea what is going on spiritually. I have been trying to prepare my heart for a couple years for what is coming. Reading, repenting and storing up as much scripture as I can. One thing I agree on with you is about the supernatural. It is just amazing to me how far we have gotten away from expecting and getting excited about supernatural manifestations. I came to the Lord in the early 70’s and things were so exciting for about 15 years…then too much prosperity teaching came in (my opinion) and we stopped having the great music, worship, and alter calls that we did in the 70’s and 80’s. Am I wrong to judge this like this? That is the only thing I saw that was different was teaching people to get rich. Thank you for teachers like you and others who are drawing us back to the square one again. Bless you and thanks for so much insight, wisdom and revelation knowledge you are sharing. Sorry about your right arm. Keen interest and more focused instruction is needed in this domain…. especially some who have been to new frontiers. Have been a bit over the edge so to speak of the natural horizons as seen and experienced in almost all that we know who hail from the ” western grid” of Christianity. The hearing and sensitivity to the presence has been a bit dulled. Sometimes it can be hard to both focus for what is now and ahead and also still recognize Gilgal in the rear view mirror.